Get your dog into the Halloween spirit by hosting a canine Halloween party. The holidays can be as fun for your pets as they are for you and your family. Halloween is the perfect time to host a party for the pooch in your life. Because it is before the major Christmas shopping season and not usually considered a family holiday, your pet's furry friends are more likely to be able to attend. Is my house spacious enough to accommodate large breed dogs? Do I have a way to close off areas of my home? What kind of condition is my flooring in, and do I care if it gets scratched or ripped? Can I host the party outdoors? How will the dogs react to each other? What kind of extra help will I have controlling the dogs? Once you have answered all of these questions to your own satisfaction, you can begin planning the party. Your spooky poochy party will need invitations, decorations, games, and food. Make these items specific to the canine aspect of the party, and it will be a success. To throw the party, you should consider many of the same things as you do when planning a regular party. Think about how many "guests" you want to invite, where they will spend the majority of time, and whether or not they get along. Inviting dogs with socialization problems may not be best for large parties; should you choose to invite dogs with personality quirks, be sure their owners plan to stay with them. The main elements of throwing a spooky poochy party are relatively the same as a human party. You should consider trying to theme the party around your tail-wagging guests. Use invitations that convey a doggy feel to the party. Buy pre-printed Halloween cards featuring dogs and that are blank inside so you can fill in the party information. Be sure to include whether or not costumes are expected, whether owners are requested to stay, and that a leash must be left with each dog. You could also make your own invitations. Either cut long bones out of construction paper or create a card on your computer for mailing. Be sure to address the card to the dog's name, "in care of" the owner's name and address. Laying a large sheet in orange or black beneath the eating area lends itself to the Halloween spirit and makes for easy clean-up. Hang Halloween decorations from the ceiling high enough that dogs cannot jump up and reach them. Balloons are best to be avoided, as they can be a choking hazard if popped. Bring in your pet's doghouse. Decorate it to look like a haunted mansion. Create dog tombstones out of cardboard and place along the walls. Make up funny epitaphs for each guest and write them on the tombstone as a party favor to take home. 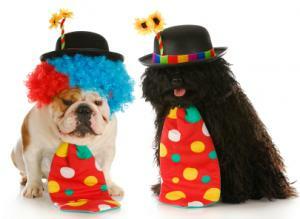 Show off costumes in a pet parade! Canine party games can get rather complicated, but you need to have a few things planned. To minimize any fighting, it is best to keep dogs busy with activities and games. Have several toys available, like chew toys and squeakers, for indoor play. If the dogs start getting restless, take them outside to run around the back yard. Have hula hoops, balls and Frisbees available for animals to stay busy. A quick jog around the block can help burn off some energy and show off their costumes to the neighborhood. A pet parade is always fun! Separating the dogs into two groups, such as one set indoors and one set outdoors, can help keep the dogs busy and easier to handle. Designate several helpers to keep the pooches safe and happy. Feeding the dogs at your Halloween party may be the hardest part. Buy cheap, large plastic bowls from a dollar store, party supply store or pet supply store. Space them out on a sheet in the middle of the floor, or at a picnic table outdoors. If the pet guests are close friends of yours, you may be able to have them seated at a table (depending on personality). Because some dogs have sensitive tummies or may be on a strict diet, it is best not to feed them a "meal." Instead, have a variety of treats available that you can put into their bowls. Make your own treats, like peanut butter lolly pops, for the pups to enjoy. Have water bowls available throughout your home and outside, and show dogs where they are as they arrive at the party. Ask for help. Managing more than four or five dogs alone can be difficult for even the best pet owners. Better yet, request that guest dog owners stay and have snacks for them during the party. Have a large supply of waste disposal bags on hand. Keep extra leashes by the door. If you notice that some of the partiers do not get along, keep them separated. Do not invite dogs you do not know well or whose personalities are not suited to group play. Finally, you want to be sure to keep your camera on hand to capture those "paw-fect" moments at your spooky poochy canine Halloween party. 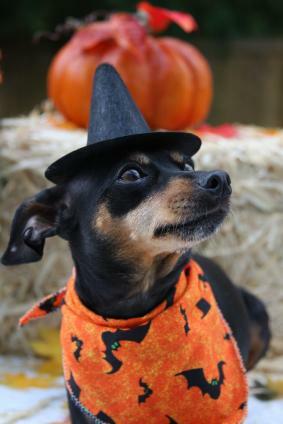 Celebrate the Halloween holiday with your canine friends. With a little extra planning, a party with puppies and dogs can go just as smoothly as any other party. Your furry friends are sure to have a paw-riffic time!